A recorded growth of 3.4 percent in international visitor arrivals through August in 2018 has been recorded in Chicago, third biggest U.S city. There was a 4.8-percent increase from China as per local authorities. It was noted that the direct flight brought more foreign visitors as per the arrival data till the end of August at the city’s two international airports – at O’Hare and Midway. Brazil was up 18.3 percent year on year , Britain up 12.7 percent, South Korea up 9.6 percent Italy up 7.2 percent, Mexico up 6 percent and China up 4.8 percent. Chicago Mayor Rahm Emanuel stated that they will continue to highlight the best of their city ensure Chicago remains a top tourist destination for years to come.Chicago closed the third quarter of 2018 with record tourism levels and during the first nine months of 2018, hotel room demand grew 4.9 percent. This has set another record for the period. Chicago is a prime location for hosting many international meetings and conventions every year, generating strong growth in its tourism revenue. 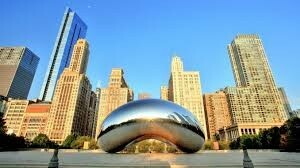 It has top tourist destinations- Millennium Park and the Art Institute of Chicago museum. There has been coordinated efforts by Chicago to bring in more travelers from China by partnering with Chinese tourism .